Yes, Nishtar is her dam but there are 3 Nishtar...Am presuming she is the Nishtar by Jubilee Star???? Thank you Ros! A different dam line could potentially change the outcome but in your case, can only imagine something sensational. When you visit..see if you can bring back some pictures to share. He is definitely a favorite! Thanks, Gari. I have only seen photographs and been told about her character but it seems you are just about spot on! It would be helpful to know her pedigree in full but two additional things: IF the Rissla is found on the dam's side of the pedigree, would expect her motion to be reasonably spectacular. Secondly the double Hamdani Simri should confer a near magical quality on her...the "Je ne sais quois" quality that marked the Hamdani Simris for Lady Anne. Would love to see photos when it is convenient. Rameed is now 21 (looks 1/2 that age) & is with us for the rest of his life - his last babies Ruby & Charlie - well we are totally delighted with them - & they are for keeps! We would like to put him to Manon bint Tarim for a foal to keep & wondered what you think of that mating? Hoping for a lovely, solid, riding horse!!!! Crossed to Manon Bint Tarim, would expect you would have a lovely flaxen foal that will be a superb riding horse as her dam's sire line is to *Rissalix, a *Berk grandson, and *Rissalix is repeated three times through Oretta, thus matching up wonderfully with Rameed's pedigree. Overall a very attractive youngster who will take his/her time maturing that will be very pleasing to the eye who will be a superb riding horse. Will look forward to seeing pictures! "A question re the strains, are there any pictures / drawings that anyone has done to show the attributes to the particular strains? I think that would be really helpful to us beginners, so that we can see the differences. Also with a description of their dispositions / characters that come out with the strain? Or could you Gari post some pics of good examples of certain strains? Also Gari you mentioned that Handani Simiri (sp!) would be good on Rodania mares, does this mix also work well the other way around? I know it sounds like a silly question but I was just wondering if this made any difference!!!?? Do you think that Lady Wentworth would have gone back to Egypt & acquire some Straight Egyption stock to put with her Crabbet Stock? Maybe to re-introduce some lines that had been lost at Crabbet? I don't know much about Straight Egyptions but am assuming that their pedigree's are fairly well documented. 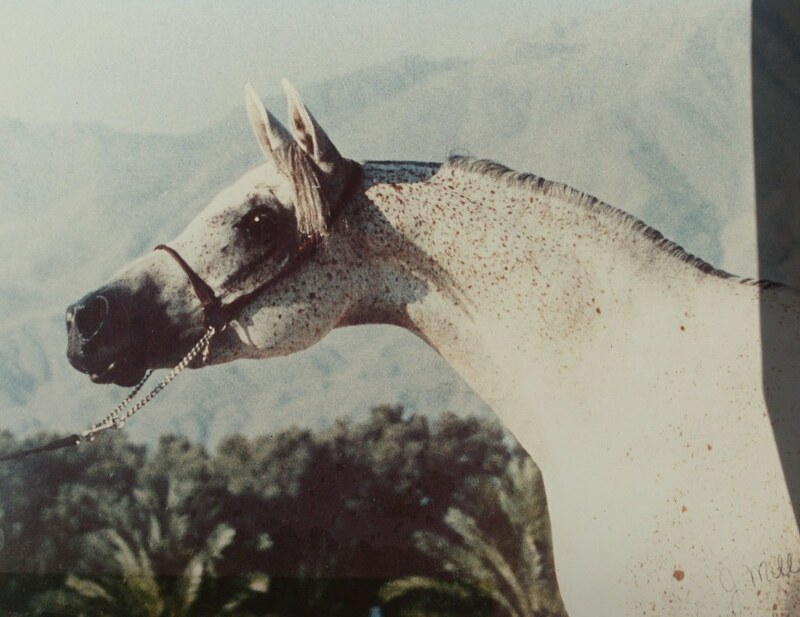 I remember seeing a picture of the beautiful mare Aliha who was by the straight crabbet stallion Indian Silver out of AK Atallah, who I think was Egyption with some Babson blood??" is very typical of the Seglawi strain of Woloszka. He is typical Seglawi in that his head is slightly longer than you would see on a Kuhailan, he is very upright and moves elegantly. The personality characteristics of the Seglawi: Extremely loyal often tending to be very attached to one human, is extremely courageous, very elegant. Some lines are exceptionally intelligent especially those coming via the Davenport import, *Wadduda. As a general rule - covers work well both ways...Hamdani on Rodania and vice versa. BUT the results tho' outstanding will be governed by the mare's line. No, I don't think Lady W would have gone back to Egypt because, so many are well over 25% Crabbet blood of which she had a lot of. Instead she would keep her eye out for the stallion that most exemplified what she was trying to achieve! That is why many of us think her first choice would have been *El Shaklan, a Spanish/Egyptian cross, aka the Golden Cross who was an absolutely stunning individual. ohhhh Egbert. Could I ask a question or 2 please? I own Rose Alba (Tribune/Rose Ruby). 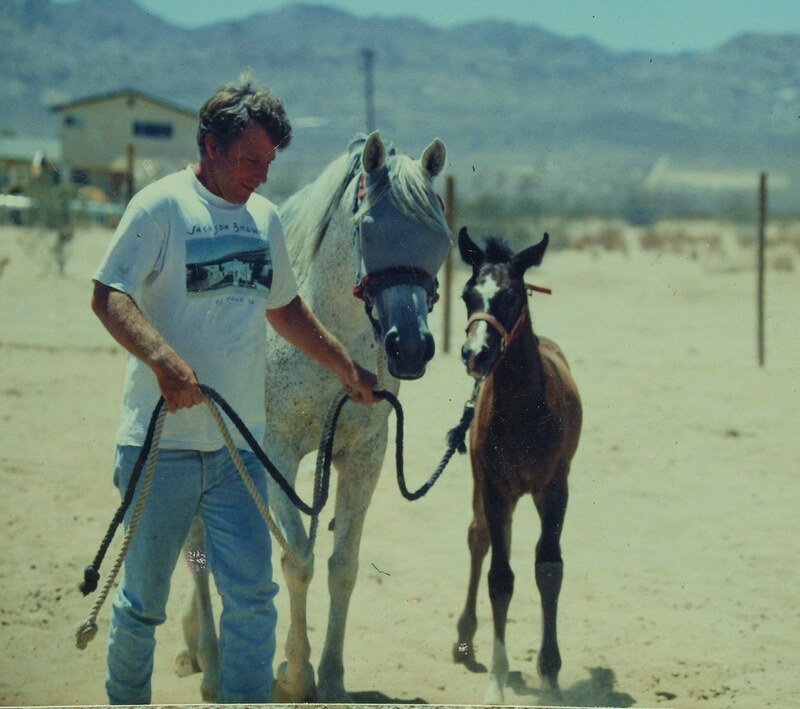 Shes been with me now for over 18 years & is my horse of a lifetime. what do you think of her pedigree? 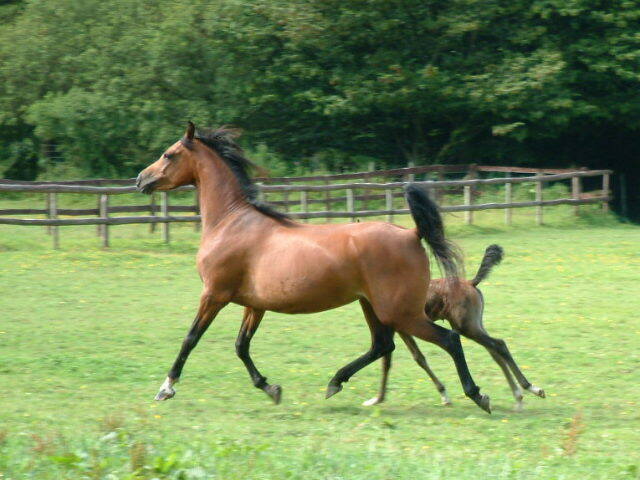 After losing her yearling last year to a tragic accident I am slightly considering putting her in foal again. Who would you suggest? 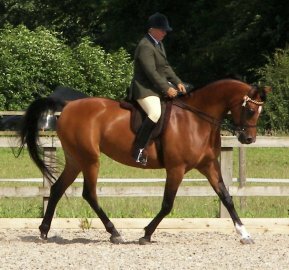 A stallion with a high % Crabbet maybe? I'd like to breed another Arab who is as versatile as she is & possibly a little extra height, she is 14.3 h.h. Theres some pics of her on 'Arabs performing - a pictorial evidence'. Another big boy with a lovely disposition is the Peck's Dervatiw Gwyddion...he is a good 16 hands, sire line Skowronek and dam line to *Nufoud, imported to the US by Albert Harris and she is said to be a Kuhailan Ajuz. Whatever the case if you are looking for height, athletic ability and a wonderful disposition...you should look at him as well as those above. No surprise...He is definitely an athlete! But as much fun as he would love to have with you, he would never be really naughty...just a gleam in his eye for some fun! A true English gentleman! thank you so much for looking at Rose Alba's pedigree for me - what a fountain of information you are. That 'extra super kindness factor' & 'pretty and motion' is spot-on Rosie. Very interesting ideas using the Carmargue lines? - never thought of that line for her? Agree with what you say 'only breed to a stallion that makes your heart sing loudest'! - so true. I've been looking at other lines but somehow they just didn't seem the 'right one' for Rose Alba. 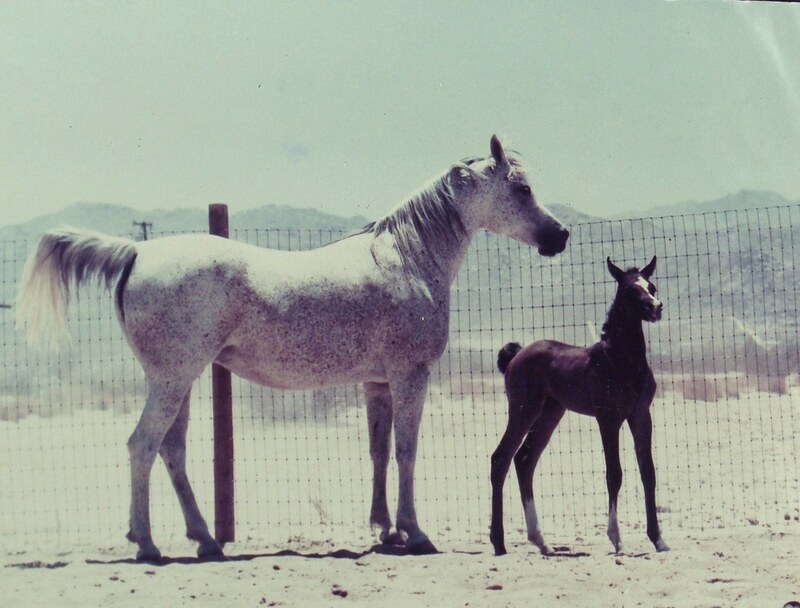 Now you have planted the idea , the more I think about it, am sure a Camargue line would make my next dream horse?